Explosiveness, as it pertains to basketball, is a combination of strength, power, conditioning, flexibility and skill proficiency. These traits are vital to the success of basketball players at every level and they improve through proper training. Even someone considered a “mediocre” player has the opportunity to shine on your squad if that player works to improve explosiveness. Gone are the days of simply playing pick-up basketball to improve as a player. To reach their potential on the court, players must be encouraged to work on skills outside of just playing basketball in order to improve their game. It is critical they participate in a truly comprehensive training program, which maximizes their athletic ability. In addition to drilling fundamentals, your players need to include strength-training exercises, low-level plyometrics, conditioning drills and flexibility movements. In particular, a player’s explosiveness on the court successfully develops through the use of plyometrics. A properly implemented training program improves your team’s overall performance by getting your players to run faster, jump higher and box out stronger. This program needs to reflect the true motions of basketball — short, high-intensity bursts of energy, which include sprinting, backpedaling, defensive sliding and jumping. Have your workouts reflect these movement patterns. By doing so, your team has the ability to compete at a high level for the entire game, which is the difference between good teams and great teams. And, don’t be scared about who your are coaching when it comes to implementing a plyometrics training program as it is designed for both male and female players ranging from junior high to the professional level. 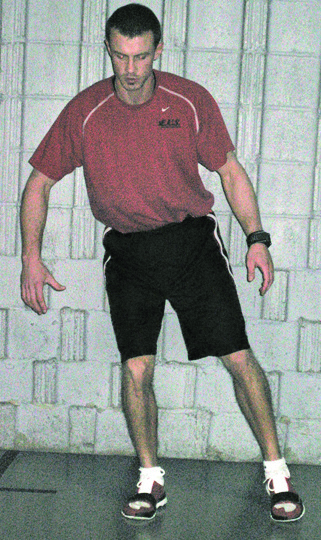 “Plyometrics” is a huge buzz word in the athletic industry right now. To place everyone on the same page, plyometrics are exercises usually involving some form of explosive movement such as jumping, hopping or bounding movement for the lower body, as well as some swinging, pushing and throwing for the upper body. 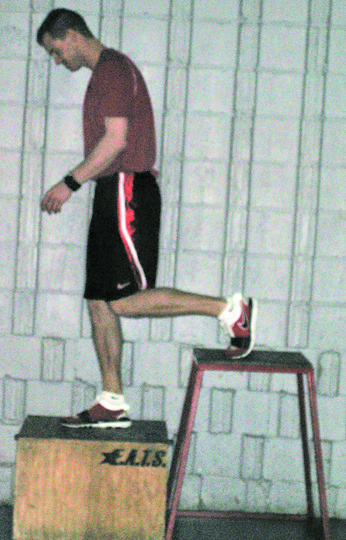 Plyometrics are designed to increase power, coordination, balance and quickness. These exercises work by using the force of gravity or of a weighted medicine ball to store the potential energy in the muscles. Then, this energy is released immediately in the opposite direction. The energy stored, in addition to the physiological responses and mechanisms in the body (myotatic reflex) during the eccentric (negative, muscle lengthening) phase of a muscle contraction, is used to produce a more powerful concentric (positive, muscle shortening) phase of muscle contraction — simply stated — a more explosive movement. Be sure to pick appropriate plyometric exercises so they are safe and a productive supplemental training tool for your players. The game of basketball already is plyometric in nature, so adding a large volume of additional plyometric exercises is counterproductive and produces overuse injuries such as orthopedic trauma to the joints, tendons, ligaments, and bones, which occurs from too much impact. Use as soft a surface as possible to reduce orthopedic stress placed on the body as it is not necessarily the jumping that potentially causes problems but rather the landing. Be very cautious when having players jump off boxes and/or performing weight jumps. As explained later in the article, players should jump onto boxes instead of off them. This ensures you are maximizing the positive part of jumping (explosiveness) while minimizing the negative part (impact from landing). To improve explosiveness, which is critical to gaining an edge in the game of basketball, have players concentrate on the following five areas. 1. Strength. Increasing strength in legs, hips and core automatically improves a player’s ability to produce force, which results in increased explosiveness. For example, the more force a player exerts against the ground, the higher the potential is to jump. To do this, while also being safe about it, players need to work within an appropriate repetition range (8-15 reps per set) and avoid maxing out (seeing how much they can lift for one repetition). Plus, as with most activities, time is of the essence. Efficiency in workouts is key, so players need to focus on a limited number of sets and exercises to make the workout brief yet intense. This also is accomplished by minimizing rest intervals between sets to induce an overall conditioning effect. Also, focus your strength program on training the entire body equally to ensure muscle balance, as well as having each exercise taken to the point of momentary muscular fatigue (the point where no further reps can be achieved). Working opposite muscle groups equally also helps reduce the risk of on-court injuries while still allowing the player to train at a high level of intensity to produce maximum results. Accomplish all of this in two or three well-planned, full-body workouts per week with each workout lasting about an hour. 2. Power. Sure, it sounds obvious, if a player wants to jump higher, that player needs to practice jumping as high as possible. Plyometric exercises such as jumping, skipping, bounding, etc. provide a means for players to practice jumping with maximal effort in a controlled and safe environment. Plus, a proper plyometric program trains the nervous system to perform athletic movements more efficiently. Once again, look for exercises that reduce impact and orthopedic stress. Use soft training surfaces and make sure players are wearing proper footwear. Stress that in plyometric training more is not necessarily better. Once all of that is accomplished, have players try squat jumps, broad jumps, lateral bounds and box jumps (have players jump onto boxes and walk off the boxes to reduce impact). Have players perform these exercises when their legs are fresh. 3. Flexibility. Improving the range of motion in a joint or group of joints is how to achieve greater flexibility. Explosiveness comes from improving flexibility in a player’s hamstrings, ankles, lower back and hips. Improving flexibility is best accomplished by performing all strength-training movements through a full range of motion, as well as performing dynamic flexibility exercises before every workout or practice. This means you should not allow players to sit on the ground and do static stretching — it does nothing to increase overall flexibility. Dynamic flexibility exercises also assist in developing coordination and motor ability, both of which are attributes that help improve a player’s explosiveness. 4. Skill Proficiency. Don’t overlook proper skill training when trying to improve players’ explosiveness on the court. Decreasing the time it takes to perform a specific basketball skill is in essence increasing the speed at which the skill is performed. Thus, increasing the speed at which a skill is executed results in improved explosiveness on the court. The most effective and practical way to improve skill proficiency is to perform skills through hours of task-specific skill practice. Have players practice specific skills as those skills are to be used in competition (or at least at game speed). For example, the more efficient a guard becomes at shooting a jump shot, the more range that guard has. Competent coaching, studying videotape and hours of perfect practice are the best ways to increase skill proficiency. 5. Conditioning Level. Keep players in basketball shape to improve their ability to increase their explosiveness on the court. Preventing or delaying the onset of fatigue is crucial to performance. A well-prepared and well-conditioned player should be just as strong and skillful in the second half of the game as he or she was in the first half. Of course, being in shape and being in basketball shape are two different things. Jogging for hours isn’t going to help a player’s need to repeat high intensity efforts and sustain them for several minutes on end with minimal rest and recovery in between. Design your progressive, pre-season court-conditioning program accordingly. Another necessity of being in great shape is keeping body fat at an appropriate level. Excess body fat simply is dead weight. Too much dead weight inhibits flexibility, reduces skill proficiency and diminishes overall conditioning ability — all of which tie into explosiveness. To maintain body-fat levels, players need to eat an appropriate diet featuring a certain amount of calories for their body types, as well as to adhere to a year-round conditioning program. Always keep in mind that additional muscle mass is not a hindrance to improving power but an asset.